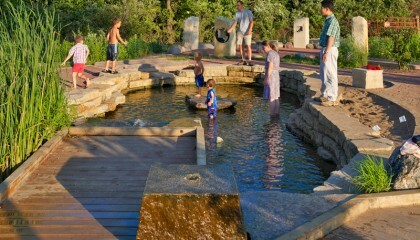 Our park systems have a multitude of competitors vying for their user’s eye and attention. Between man-made destination water parks, to indoor digital driving ranges, to digital devices which encourage park users to look more at their phone than their surroundings, our parks and park systems are in need of attention. That’s why state park directors are looking at innovative ways to brand and sign their parks in a way to grab attention and attract more users. This article address branding, identity, signage and messaging within a coordinated park graphic system. We’ll share “WHY” coordinated graphic systems are becoming necessary in our state park systems, followed by a bit of our process created for the Kansas Department of Wildlife, Parks, and Tourism. Let’s clarify a few terms, starting with “coordinated park graphic system”. For the purposes of this article, we define a coordinated park graphic system as a family of graphic logos, signage, and wayfinding which serve as the public interface to a park. They are the symbols, signs, and logos in which users identify and interact with when entering and navigating a park. 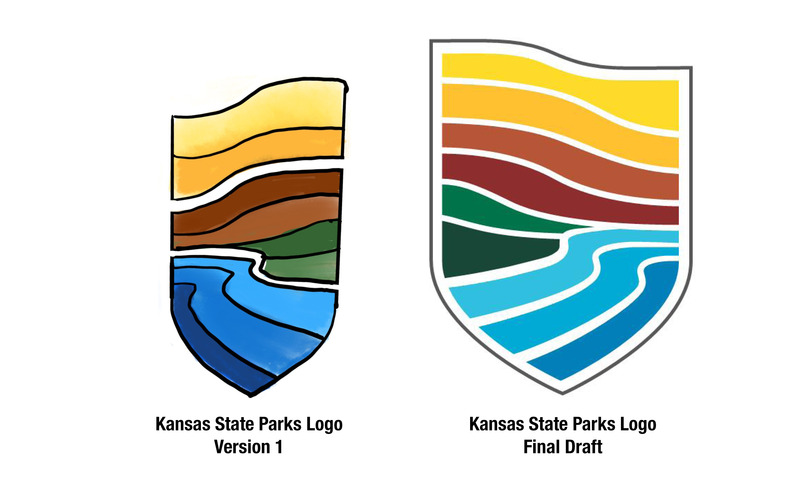 The graphic logos we will discuss include both park system logos, which represent a collection of parks (Kansas State Parks, National Park Service, etc. ), as well as individual park logos (Milford State Park, Bryce Canyon National Park). The two logos must be designed in a way which allows them to stand on their own and to be integrated together. Coordinated wayfinding signs are customized signs which are unique to a specific system. 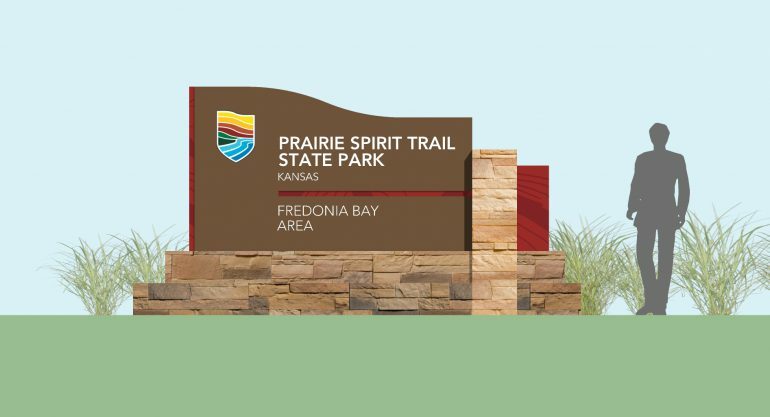 In the case of the Kansas State Parks, all parks will have a customized family of signs that is consistent throughout the state. It’s essential that the form of the sign be unique, so it won’t get confused with any other park system. When a graphic and signage system is coordinated, the signs and graphics work together to share a similar story. The customized form of the sign is as identifiable as the logo that rests upon it. In this way, several branding efforts are being accomplished concurrently: (brand one) the system logo seen on the interstate sign leads users to (brand two) the park entrance sign which leads them into the park where they buy (brand 3) that park’s customized water bottle. By coordinating all these efforts, the logos work together to share a common story – one that ties the system together as a whole, while celebrating the uniqueness of each individual park. Finally, it’s important to note that while this particular case study explores the realm of a statewide park system, the principles work across many scales and systems. 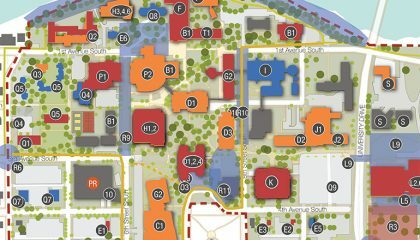 The ideas could be implemented in any system with unique user destinations including corporate or academic campuses, healthcare buildings, and/or commercial developments. While we’ve discussed a few of the reasons that coordinated graphic systems are necessary, there are many deeper reasons which motivate the process. These reasons are common though many branding and marketing efforts, this basically is a branding exercise. Know your audience!! There are two broad groups to think of when addressing the reasoning for park graphics: internal and external. Internal audience is park staff and management, the external audience is the park’s “clients” – the general park users, both current and future. Coordinated park graphic systems can help clarify the mission and direction of a park or park system. If your park decides that it is known for great fishing, and opts to include fishing as a primary theme of its logo, the logo serves as an impetus to ensure high-quality fishing habitat is available in the park. 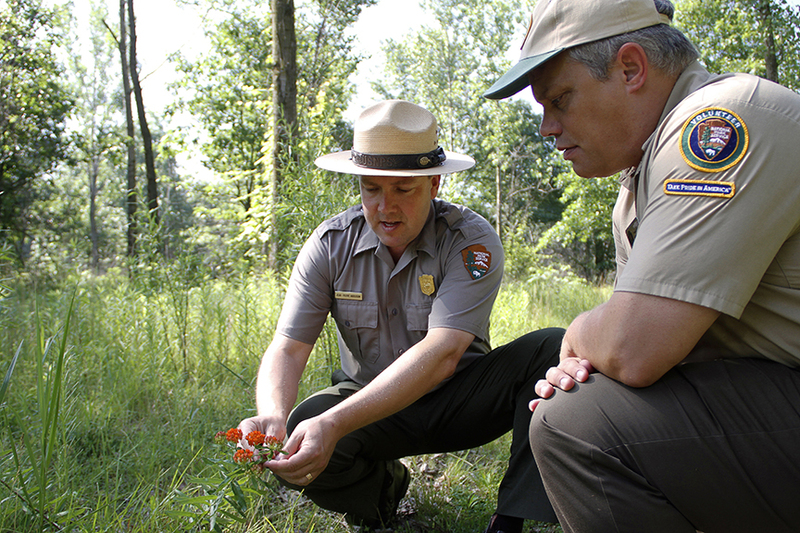 It may impact the decision of which parts of the park are developed first or help shape how maintained dollars are used. While parks are always multifaceted, and attracting a broad range of park users is important, maintaining a keen focus on what your park is “selling” is essential in breaking through the advertising noise your users are experiencing on a day to day basis. Developing pride in a system or a park is an often overlooked byproduct of a good marketing strategy. The public presence and persona that is developed through a good branding exercise means your staff have a symbol to stand behind. Think of the National Park Service: there are thousands of volunteers that yearn to don the NPS logo every year, because of what that symbol has meant over the past 100 years. – A high quality logo on a high quality sign can speak volumes as to what a user can expect from a park. It is the first symbol or indicator of the park itself, so it is the park’s first opportunity to declare what a user can expect and declare a set of values. Materials, form, and scale are easy tools to help foretell the values of a park. Think of the scale of many National Park signs – they are monumental in scale and often utilize natural materials because they reflect the scale and atmosphere of the landscapes held within their boundaries. – Signage and logos can also dictate how users should perceive the park: if a logo includes an abundance of clear blue sky, it can unconsciously sell the idea of parks as a pollution-free respite from congested urban life. As a contrast, if a logo utilizes a view of a dense forest, and a forest is not to be seen in the park, it may lead to disappointment or distrust in the park system. – Graphic style plays heavily into the values that are created. 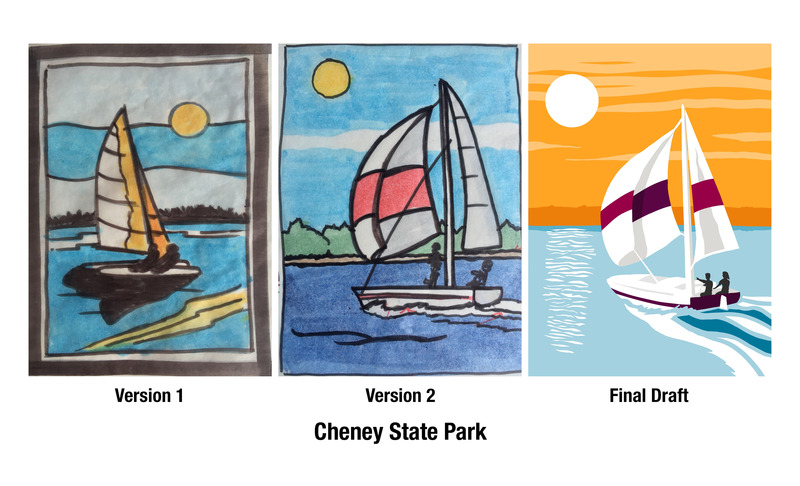 If a park utilizes a lithographic style logo, which was made popular during the 1930s with the Works Progress Administration, it might signal to users of a classic or historic park experience: scenery, relaxation, and history. If a park uses a highly stylized or abstract logo, it may signalize a more urban park experience: runners, dogs, and increased density. If a logo can successfully set park expectations, it will eventually take on an even deeper meaning for park users: one of comfort and even ownership. – If the logo matches user’s experiences and can match the set of values they place in the park, the logo can take a life of its own and be used as a personal symbol of the park. – The most obvious benefit of the graphic system is to advertise your parks. The logo – regardless of context – gets the concept of the park or park system in front of potential users. Park-branded merchandise is the best form of that advertising, as it often means that a user paid money to advertise for you. – However, park users are far more likely to purchase branded merchandise if the logo attached can publicly announce their own values. Shoe companies use this strategy well, encouraging users to purchase often overpriced goods because the brand itself indicates socio-economic status, taste, style, etc. While we don’t expect that same demand in park branded merchandise, that goal should still remain: logos should indicate values – not only for the park, but for the park users as well. – As mentioned previously, there is a constant buzz of advertising surrounding our daily lives. Developing a clear and concise logo system can elevate the park’s status despite that noise. The logos for each park must set the park apart, both from competitor parks as well as other parks in the system. 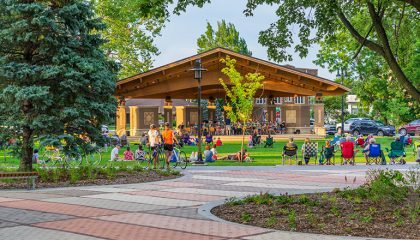 If done successfully, the logos for a group of parks will sell the park system as a whole while celebrating the park’s inherent uniqueness. The park system logo, which unites them all, must then summarize the entire system – ideally tying the best part of the parks together into one statement of value. – Since the first National Park was developed in 1872, parks have been developed as tourist destinations. The act of naming locations – especially overlooks and unique features like waterfalls – was done to assign importance and encourage visitors to experience them all and check them off a mental list. We continue that process today and, while most parks name destinations to help distinguish different trails or campgrounds, our inherent nature is to commoditize areas of the parks so people see them all. Park logos unabashedly accomplish that same goal: develop logos for each park so people feel like they must see them all. Especially if the logos highlight dramatically different landscapes within a defined area, such as parks in a state park system, people will want to visit all the parks just because the logos show such diversity. Therefore, park logos should highlight that diversity to the make each park enticing and different. The widely popular WPA posters, developed for the National Park Service during the 1930s and 40s, explicitly had that purpose: highlight diverse landscapes to spur tourism. Hiring a design firm with both graphic designers and landscape architects, is beneficial to the process of developing a coordinated and cohesive system of logos and signs. While it may be tempting to accomplish these goals with in-house talent, a quality design firm will provide insight outside of the park organization. 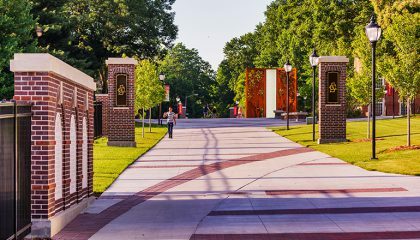 Landscape architects understand the subtle difference in park use, landform, plant and animal life, and topography and can work close with graphic designers to ensure that items such as landform and plant material are represented accurately. Ask Questions!! Once your design team is in place, it’s time to start asking serious questions. These questions are intended to not only shape the direction of the logos, but to verify that your park system is headed in the right direction. Because the logos are rather aspirational, it’s important to have your park systems aspirations firmly in hand before moving forward. There are two sets of questions to ask: questions about the entire park system, and questions about the individual parks. Below are a series of questions to get you started. It’s important to note that some of the best people to answer these may not be in a park leadership position, so disseminating questionnaires may be beneficial. What is our park system known for? Is there a misconception about state parks we’d like to correct? Is there a role we’d like our parks to play that isn’t realized yet? What sets our parks apart from others in the region/country? What ties our parks together? – Is it Landform? Flora? Fauna? Prevalent uses? Clientele? History? Culture? Seasonal interest? Day/night interest? Atmosphere? Is there a future use/vision we’d like the park to adopt? Is there a misconception about the park that we’d like to clarify/correct? What should the park be famous for? Why should someone choose this park over others? Are there unique stories that this park holds? Tour the Parks – It’s essential to visit all of the parks in the system. Although this can be something of a challenge, simply because of distance and available time, it’s extremely valuable to the process and the best way to get a first-hand look the major destinations and amenities, key views, park entrances, park maintenance facilities, and any other key features that defined the park. In the case of the Kansas State Parks, we traveled to almost all the parks in two separate three-day trips. When the tours are completed, we recommend that the park system and design team work together to fully develop and document all possible themes for each of the parks and the park system as a whole. The Beginnings of Design – The rest of the process is all design. While it may seem like a simple process, now that the theme is clear, the real work is only just beginning. It’s best to keep the design process intentionally iterative in nature: plan for several rounds of refinement and design options. It is difficult enough to develop one graphic; developing a family of graphics which all must work together is akin to a design marathon. Iterative Drawing – Next, we recommend sketching out all of the logos – perhaps even several versions of the same one. This will help to identify and document the primary logo elements, shape, and size. Final Approval – Once the logos have been finalized internally, it’s important to share them with the individual parks in a careful manner. You’re asking the individual parks to adopt this logo and sell it to their constituents, so it must have full support from the staff. If they are asked to sell something they aren’t behind, the merchandise and brand will not be promoted to its fullest extent, limiting the overall success of the initiative. Below are a few examples of the logos that are under creation for the Kansas State Parks. We’re intentionally showing a few iterations of each logo to highlight the changes between initial hand-sketching to the final digitized form. These are still in a draft state, as the other logos are in the process of being finalized, however we’re finding the full suite to be compelling and unique – exactly like the landscape of Kansas.